Akit's Complaint Department: All-Day Express Bus Service for the 38-Geary? As I'm sitting here at home taking the day off work due to the cold, I spent time watching a bunch of YouTube videos about bus rapid transit (BRT) used in places like Bogota, Colombia. They spent a dozen years developing their transit system to allow people to travel long distances quickly with unique features including level platform boarding, free feeder buses to major stations where passengers pay only for the BRT ride, and a central control office that operates like an airport's traffic control tower. One of the reasons why a city would build BRT is due to severe traffic congestion. Sure, it would rip away a few lanes of traffic, but if the system works successfully, more would ride the bus instead of taking their cars. San Francisco does not have a huge traffic problem, even though we do get grumpy about how long it takes to drive along 19th Avenue. Another reason why a city would build BRT is because it either serves multiple cities/counties or the city is so large, it truly needs a transit service that is fast. San Francisco isn't that big and Muni only serves San Francisco (okay, part of Marin County on Sundays). AC Transit and VTA operates in a larger area, thereby the BRT service was a necessity to move people around. Lastly, BRT would be built in areas that are not highly developed, but having the line would actually help build development. If Muni targets Geary and Van Ness corridors, it's likely they'd face some heavy resistance from store owners and residents about the construction and/or loss of business and parking. Muni got lucky with 3rd Street, since it wasn't that much residential and was mostly industrial, it was an easy build to get the T-Third line running, and the new transit line helped build new housing projects and the UCSF Mission Bay campus. I was thinking to myself, could Muni fix the 38-Geary to provide faster service to our city's residents without the huge expense of building BRT? Sure, the 38L-Geary Limited was a smart idea to shave about 10 minutes from end to end, but it still has a reputation for being slow. The Geary express buses during peak morning and evening hours are fast and popular, but they don't run all day long to provide that great service to the public. If the city can't build BRT service, why not modify the Geary bus line service? Instead of having a skip-stop service like the 38L, why not split the limited buses into three segments and have an all-stop local/feeder bus? The "A" line service provides skip-stop service (using existing 38L stops) from downtown to Presidio. The "B" line service provides skip-stop service from Park Presidio to Presidio, and expresses to downtown. The "C" line provides skip-stop service from 48th Avenue to Park Presidio, and expresses to downtown. The "local" line services all stops on existing 38-Geary bus stops for those who cannot walk from the skip stop to their final destination. Presidio Avenue and Park Presidio Boulevard are the two main transfer points for the skip-stop buses. 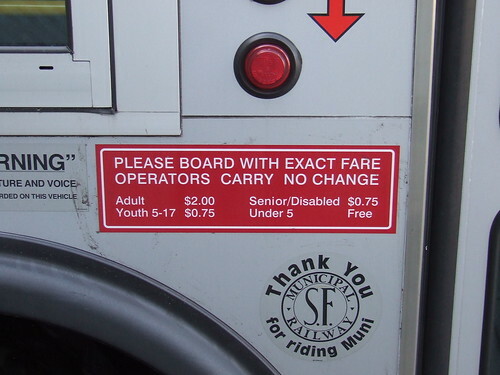 A passenger needing to go from 6th Avenue to 48th Avenue can ride the "B" bus to Park Presidio, and a timed transfer for the "C" bus is there to take the passenger to 48th. The three lines is made for passengers to go to & from downtown with express service for those living far away from the downtown region, but it can still be treated like the 38L-Geary Limited because the transfer points still allow those to ride to their destination that's not in downtown. I'm not exactly sure how faster the ride might be. For sure, the "B" and "C" lines would be quicker because it doesn't have to make additional stops between their region and downtown, and can utilize the Masonic tunnel and Fillmore underpass. If Muni also implements ticketing machines at stops, the buses don't have to idle at their designated stops that long. Great timing on the post. If you haven't seen it yet, LAVTA (AKA Wheels Bus) will be launching the Tri-Valley Rapid bus next week. (www.trivalleyrapid.com) That will be the first Bus Rapid Transit in the Bay Area that I am aware of, anyway. It will be providing service to the existing Dublin/Plesanton BART station and the new West Dubli/Pleasanton BART station when it opens in a month or so. One major issue I can think of is that downtown to/from Richmond ridership is significantly lower during non-commute hours. The ridership may not justify the resources necessary to make it happen. My guess is that it will just end up like the Culture Bus if it does. During mid-day, I've taken the 38L out to 20th Ave a few times from its first stop on Market. Typically the 60 ft coach is not full and doesn't have a single standee even as far as Union Square. The coach could travel the entire route and there would be maybe only a dozen standees the whole time. The number of riders benefiting from reduced travel times will be few. Also consider that Muni may have to divert drivers and coaches from other lines to make the segregated lines happen. One idea of BRT is to increase speed of the bus line throughout the entire route not just between certain sections. This is partly accomplished by giving the BRT vehicles ROW to speed it up. Preemptive traffic lights and dedicated ROW lanes on the roadway ensures that they will not be delayed by private autos.Using these methods, the BRT vehicle can keep moving at speed and reducing travel time. The closest thing I can think of is Caltrain Baby Bullet in which other routes yield to it so hat BB can keep its speed up and reduce travel time. Imagine how fast the 38L would be if it only had to stop to take passengers or let them off. Another benefit of platform boarding and high-floor BRT is that the floor and platform will be even. No more kneeling bus, no more wheel chair lifts, no more people with mobility issues clutching the hand rail going up or down one step at a time. Part of the reason buses are slow in SF is because they have to compete with private autos on the roadway. My daily 16X ride travels down Oak Street and is fairly quick until it gets to about Octavia because the freeway entrance is there. My bus ride could probably be shortened by about 5-8 minutes or so if it wasn't delayed by the vehicles waiting to to turn right on to Octavia.